Border Police stop suspicious Arab driver at checkpoint, discover would-be infiltrator hiding in car's trunk. Border Police officers caught an Arab infiltrator attempting to cross into Jerusalem by hiding in the trunk of a car. The incident occurred on Thursday night, when a 35-year-old Arab driver aroused Border Police officers' suspicions when he tried to cross into Jerusalem via the a-Zaim security checkpoint. 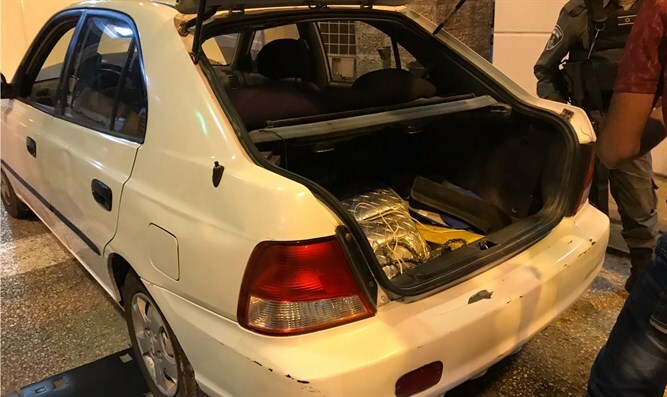 The officers insisted on inspecting the car, and upon opening the trunk discovered an Arab Hevron resident in his 20s attempting to cross into pre-1967 Israel without the necessary permits. Both Arabs were taken for interrogation, and the vehicle was confiscated. "Israel Police's activities to prevent Palestinian Arabs from entering illegally into sovereign Israeli territory brought about the arrest of many would-be infiltrators. Some of these attempts endangered the lives of the Palestinian Arabs themselves," an Israel Police spokesman said.